Google has started the rollout of Android Messages for the web from today, allowing users to send and receive texts from a desktop browser. Google has confirmed the rollout in a blog post, but not everyone can use it right away as the Android Messages on your smartphone should be upgraded to the latest version- 3.3.043 and then wait for Google to enable it for you on the server-side. However, Google has stated the rollout will continue over the next one week, which means that you’ve to wait for the new feature to experience it. Once the feature gets enabled, users can send text, images and stickers on the web version. The process of connecting to the web version of Android Messages is very much similar to that of WhatsApp Web. To get started, users have to visit the Android Messages for web (https://messages.android.com/) from their desktop. After opening the website, they’ll be presented with a QR code, which by the way has to be scanned from your smartphone app. The next step involves waiting part as you should wait for Google to enable the feature for you on your smartphone. For the same, make sure you’re on the latest version of Android Messages application and keep checking for “Messages for web” option under the three-dot menu. Once it appears, you’re good to use the Android Messages web version. The process is straightforward, and this is how Google also implemented Allo’s web client a while back. Most of the stock Android smartphones come with Android Messages app pre-installed, and for other handsets, the app can be downloaded for free from the Google Play Store. With Android Messages for web, Google is yet again trying to make a mark in the instant messaging segment. 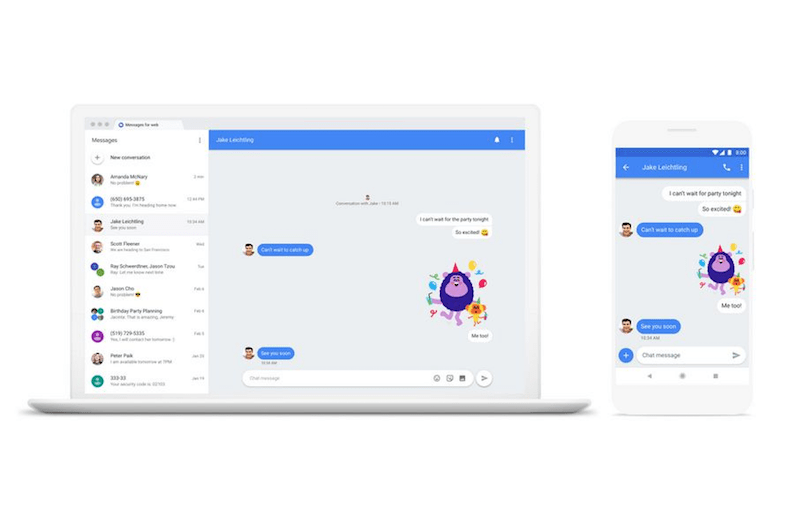 To make this service, Google has implemented Rich Communication Services (RCS) inside Android Messages and to compete with services such as WhatsApp, iMessage, Messenger and others, a desktop version is a much-essential one. And here’s Google first significant step in the segment. Furthermore, Google has already confirmed that it will not be developing Google Allo anymore, instead, it will be completely focusing on Android Messages to make it a mainstream messaging app for Android smartphones. This is all fine BUT again … I fail to understand why Google Talk was killed off in the first place when it was so widespread before Whatsapp … now they are trying to revive something which they should have nurtured long back so they didn’t have to do all this ‘double kaam’ = unnecessary work. GTalk used to be all that Google is now trying to have back. By now GTalk would have been no.1 instead of Whatsapp – is what i am trying to say. +10 Even Allo is also Good. From Google Assistant to Incognito mode Chats. I’m saddened to know that they won’t develop it anymore.